Blue is the most popular zircon color and fine blue zircon has more sparkle than any other blue stone in the gemstone world. The colors range from light to medium blue, sometimes with a slight greenish secondary hue. Blue zircon is produced by low temperature heating, but only the Cambodian and Burmese zircon will turn blue when heated. Prices depend on color saturation, clarity and size. Fine saturated blues in sizes over 10 carats are typically $300 to $400 per carat, while high quality stones in the 5 to 10 carat size sell for $200 to $300 per carat. The golden color known as honey zircon tends to be less expensive, as does the red zircon from Africa. 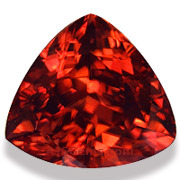 Red zircon typically ranges in price from $75 to $125 per carat, while the honey zircon sells for $50 to $100 per carat. Exceptional colors or very large sizes will be more. 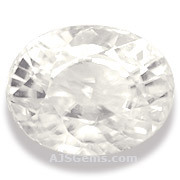 White zircon, once sold as a diamond substitute in the days before synthetics like moissanite, is still quite inexpensive at about $35 to $50 per carat. 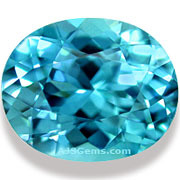 It is one of the most brilliant of all colorless gemstones. Green zircons are exceptionally rare. They form as the result of natural radiation in a process known as metamictization. Over long periods of geological time, radiation produces changes in the crystal lattice so that these metamict zironcs are amorphous rather than crystalline, while still maintaining the characteristic zircon fire. These rare specimens are coveted by collectors. 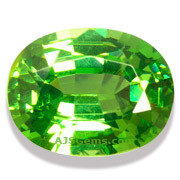 Fine clean specimens in pure green sell for prices around $250 to $300 carat, while olive-green zircons are typically less. Natural zircon is in limited supply and can usually be found only from specialized gem dealers. You are unlikely to find it in retail jewelry stores. The blue zircons come mainly from Cambodia and occasionally from Burma. The honey zircons come from Cambodia and Tanzania, while the reds are mainly from Tanzania. The rare greens have been found in Sri Lanka and Tanzania.